2010 10k: "Our cancer vaccines are comprised of tumor cells that are genetically modified to secrete an immune-stimulating cytokine known as granulocyte-macrophage colony-stimulating factor, or GM-CSF, and are then irradiated for safety. 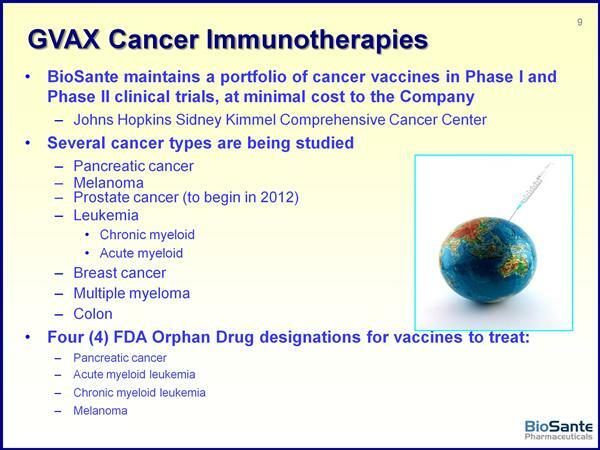 Since our cancer vaccines consist of whole tumor cells, the cancer patient’s immune system can be activated against multiple tumor cell components, or antigens, potentially resulting in greater clinical benefit than if the vaccine consisted of only a single tumor cell component. Additionally, the secretion of GM-CSF by the modified tumor cells can enhance greatly the immune response by recruiting and activating dendritic cells at the injection site, a critical step in the optimal response by the immune system to any immunotherapy product. 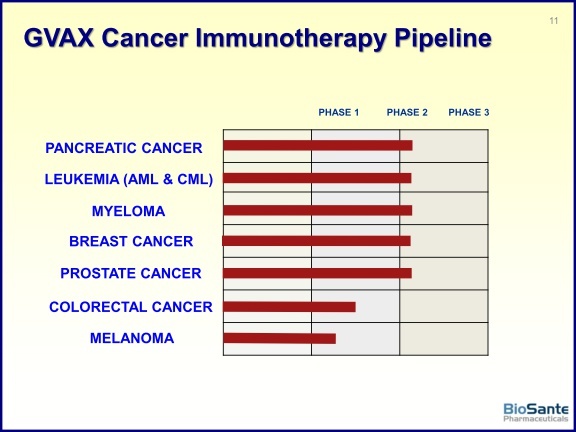 The antitumor immune response which occurs throughout the body following administration of our cancer vaccine potentially can result in the destruction of tumor cells that persist or recur following surgery, radiation therapy or chemotherapy treatment." 3/3/2011: announced publication of phase 2 data from pancreatic cancer vaccine trial in 60 pts at Johns Hopkins. Median disease free survival was 17.3 months, median overall survival was 24.8 months. This compares favorably to historical data of 15-20 months survival- but the press release was highly inappropriate in the manner in which it directly compared the data. Had originally guided this data by ye2010 and then 2/14/11 webcast said 1q2011. Click here for my blog post about this data release. 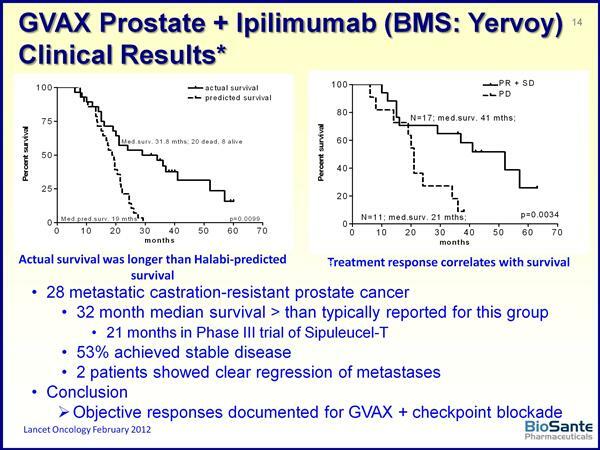 6/2011: announced that FDA has lifted clinical hold on GVAX prostate program (Click here for PR). Planning for new p2 trial is underway. 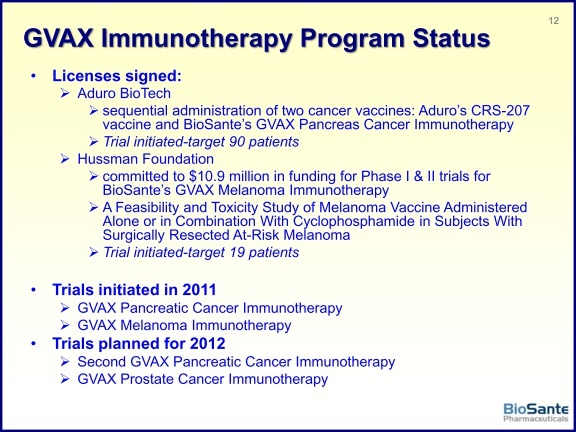 BPAX paid for drug manufacturing, study will be funded by Johns Hopkins, Prostate Cancer Fndn, and OneinSix Fndn.